When you want experienced and knowledgeable roofers to work on the roof of your Orillia home, contact us. Has your Orillia, Ontario home been subjected to extremes in weather lately? Have you wondered if your roof will withstand the howling winds or beating hail? If so, you may be brainstorming ways that you can keep it safe and secure against future assaults. Essentially, you want it sealed off and ready to handle any weather that may suddenly attack. Your weather-proof checklist should include all windows, walls and doors, scanning for any gaps that may exist. One of the most important areas to check is your roof. If it has shingles that are missing, holes or weak spots, you will need to get it repaired as soon as possible, so it can provide you with the ultimate protection. While we know that you could set aside a day to go over the entire roof, checking for any weaknesses, why take that time out of your schedule when our roofers could come and check the roof for you? Once we’ve checked the roof, we can also recommend any repairs that are necessary and provide you with an estimate of how much the repairs will cost. We will even take care of providing you with an entirely new shingle roof, at an affordable cost, if that is what is needed. Regardless of why your roof is unsatisfactory, our team of roofers can help you make it safe and secure once again. 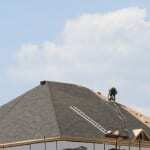 At Slippery Slope Roofing, we have over 50 years of combined roofing experience. Our roofers will do the job correctly, using the proper underlays and tools. We keep our site clean and complete every task in a timely manner. We also choose to focus on only one job at a time, so we can fully dedicate our efforts to completing the task at hand. When you want experienced and knowledgeable roofers to work on the roof of your Orillia home, contact us. At Slippery Slope Roofing, our roofers proudly serve Orillia, Barrie, Bradford, Alliston, Newmarket, Midhurst, Cookstown, Beeton, Innisfil, Angus, Collingwood, Wasaga Beach, Oro-Medonte, Midland, New Tecumseth, Clearview, Bradford, Essa, Stayner, Springwater, and surrounding areas of Ontario.